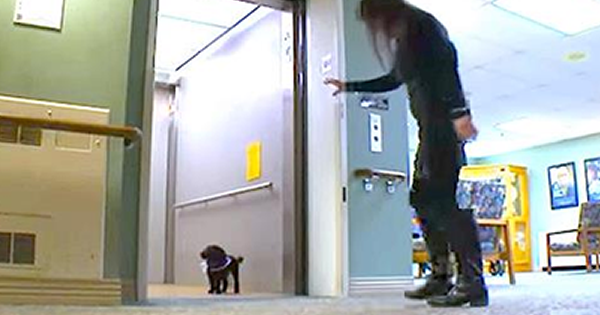 This dog heads straight to the elevator and starts… There’s really no mystery as to how dogs earned their reputation as “man’s best friend.” But below is a great example of how! This is a story of a dog named Nala that can be found at the retirement home. Nala is a five-year-old teacup poodle helping to cheer up the seniors at the Lyngblomsten care center in St. Paul, MN. Pet owner is Doug Dawson he is a medications assistant at the nursing home, and he also brings Nala everyday to work. He says he doesn’t see her until the end of the day. When they stroll through the front entryway, the puppy goes to the elevator and starts to make her rounds as the center’s unofficial angel. Nala has no formal training as a therapy pet, but instinctively knows to check on the elderly residents and appears to love sitting on their laps and cuddling close to them. Many of the residents believe this dog is is a blessing from above and after seeing this video, I think you’ll concur.